Pope Francis reminds the Synod that he has the last word. “The synod journey culminates in listening to the Bishop of Rome, (who is) called to speak authoritatively as ‘the Pastor and Teacher of all Christians,'" Pope Francis stated on October 17, on the eve of the final week of the synod on the family. In a keynote talk of the utmost importance delivered at the celebration for the 50th anniversary of the establishment of the synod of bishops, Francis spoke about “synodality in the church,” the synod’s place within this, the relation between the synod and the Successor of Peter, and reminded the synod fathers that he has the last word. Paul VI had established the synod he said, so that "it should re-propose the image of the ecumenical council and reflect its spirit and method,” but he foresaw then that with the passage of time “it could be greatly perfected.” John Paul II too recognized that the synod “could be improved” by giving it fuller collegial responsibility, and Benedict XVI made revisions to it in the light of new Canon Law. 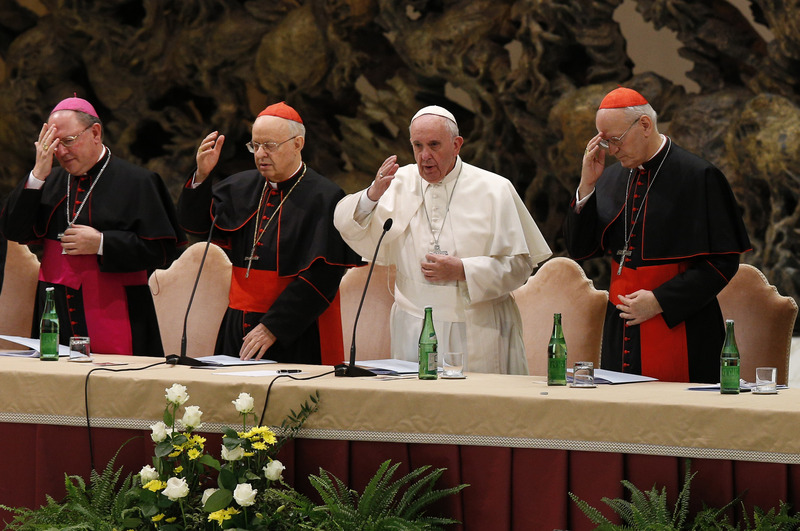 “The way of synodality is the way that God wants for the Church of the third millennium,” Francis declared. He explained that what Jesus is asking of the church today “is all contained in the word ‘synod,’” which means “walking together—laity, pastors, the Bishop of Rome.” This is an easy concept, but it’s on that’s difficult to put it into practice, he admitted. He recalled that the Second Vatican Council had reaffirmed that “the People of God is constituted by all the baptized” and that “the entire people cannot err in believing.” Then, in a statement that has far-reaching implications, Francis declared that “the sense of faith impedes the rigid separation between the Teaching Church and the Learning Church, because the flock possesses its own ‘sense’ to discern the new roads that the Lord reveals to the church...” He revealed that it was this conviction that led him to hold the consultations in churches worldwide before the 2014 and 2015 synods, because it’s not possible to speak about the family without talking to families. “A synodal church is a listening church, (one that is) aware that listening is more than hearing. It’s a mutual listening in which each one has something to learn,” he stated. He explained that the synod of bishops “is the point of convergence of this dynamic of listening conducted at all levels of the life of the church,” and recalled that on the eve of the 2014 synod he had asked the Holy Spirit to help the synod fathers to listen to God, and with God to listen to the voice of the people so as to understand what God is calling us to do. Much of the attention at this synod has been focused on the final document, with a minority of fathers expressing anxiety or even worried that the text might be predetermined or even dilute Catholic doctrine. Some have wanted a paragraph by paragraph vote, as if everything depended on the final vote. In his talk today, however, Francis called them to their senses by reminding the 270 fathers that, in actual fact, “the synod journey culminates in listening to the Bishop of Rome, (who is) called to speak authoritatively as ‘Pastor and Teacher of all Christians. '” In other words, the buck stops with him, not them. Then in a clear reference to the bishops’ conferences, Francis told them that “in a synodal church it is not opportune that the pope replaces the local episcopates in the discernment of all the problems that present themselves in their territories.” For this reason, he said, “I feel the need to proceed in a healthy ‘decentralization.’” He had already stated this in his programmatic document “The Joy of the Gospel” (N.16 and 32), and today he declared categorically that he intends to move ahead with such decentralization. Francis then came to what he called “the last level” in the exercise of synodality. This exists at the level of the universal church; here, the synod of bishops, representing the Catholic episcopate, becomes the expression of episcopal collegiality within one church that is entirely synodal. That Francis has affirmed all this on the eve of the conclusion of the Synod on the Family is particularly significant not only for the internal life of the Catholic Church, and the follow up to the synod, but also for her relations with the other Christian churches and communities—beginning with the Orthodox Church, and her witness in the world. When he finished speaking, the audience, that included some 300 cardinals and bishops, gave Pope Francis a standing ovation. Jesus said to St. Francis of Assisi. "Rebuild My Church!" and that's exactly what Pope Francis is doing. It has become increasing clear why the Spirit of Joy chose the name "Francis" for the Pope. Incidentally I also see joyful Trinitarian High Fiving in the name "Francis" for a Jesuit Pope, remembering that it was the Franciscan Pope Clement XIV who suppressed the Jesuits, a delightful humorous "gotcha" making He who is throned in heaven "laugh" as Psalm 2 says God can do. And with God, also those in the Church with "eyes to see and ears to hear." Mr. Reyes, Charles Chaput is a great defender of the poor. His sense of the Gospel mandate is sure and true. Here are some of the Archbishop's remarks from the 2014 Erasmus Lecture: "As I’ve said many times before, we have serious obligations as believers to care for the poor, the immigrant, the elderly, and persons with disabilities. Those duties belong personally to you and me, not just to the government—though government clearly has an important role. If we ignore the poor, we will go to hell. If we blind ourselves to their suffering, we will go to hell. If we do nothing to ease their burdens, then we will go to hell. Ignoring the needs of the poor among us is the surest way to dig a chasm of heartlessness between ourselves and God and between ourselves and our neighbors." Will all due respect to this article and the idea of a listening church, but shouldn't that line be "ears to listen" and not "ears to hear"? I speak somewhat tongue-in-cheek when I misrepresent the Scriptural passage because there is so much talk today of the "listening church." Rather, it is wiser and more proper to speak of a church that hears, just as Christ words are "Blessed are they that hear the word of God and keep it," rather than "Blessed are they that listen to the word of God and keep it." There is a deep divide between the concept of hearing and listening, which is why the word-choice of "listening" is detrimental to the idea of the Church. The word listening implies consideration or contemplation but no necessary action. Listening requires no act outside of contemplating the sound or the words said. Hearing demands action. Hearing requires a response, and the failure of the hearer to respond can be significant. Thus the words, "Blessed are that hear the word of God and keep it." The act requires an immediate response from the hearer to follow the commands of God. "They that have ears let them hear!" There is no let them listen. "For the heart of this people is grown gross, and with their ears they have been dull of hearing, and their eyes they have shut: lest at any time they should see with their eyes, and hear with their ears, and understand with their heart, and be converted, and I should heal them." It would be good if the Synod heard and heeded the word of God, which has already made its voice resound in the Eternal Word, the Word-made-flesh, and not the words of a people who want a church that listens to their whims and wishes, and grants them their desires like a parent who might spoil his child. As a side-note, it is fantastical and, dare I say, hypocritical to hear clergy talk of listening, when the modern church has continue not to listen to the Blessed Virgin who has called specifically for the Consecration of Russia to Her Immaculate Heart as the means to end the modern crisis and catastrophe. How can churchmen claim to want a listening church when they do not listen to the very Mother of God herself--or rather, I should say, hear and heed the very Mother of God herself? I find the contents of this article very distressing. Because the Bishops are so divided at the Synod, a delegation by the Pope under the banner of 'conversion of the Papacy' giving 'authority' to customise doctrines, structures and more to Bishops' Conferences globally which themselves are divided Bishop from Bishop, will not be the end of it. Within every Diocese, unhappily Priests themselves often find themselves not receiving the full support of their local Bishop in many important ways regarding Catholic belief. For some decades, Catholic laity have worked at getting along together with all the various understandings of what it means to be Catholic. However, once the new official understanding of customising belief and practice swings into full gear, what we will see dissolved - some might say 'annulled' is the universality of the Faith and the unity arising from the universality of the Faith. No matter what side of the fence Catholics are on, is this what we want? Isnt this one of the distinctive elements of what it means to be Catholic ? I have many good Christian evangelicals who belong to a Church reduced to some 50 'souls' centered around the understanding of what it means to be Christian in the eyes of their own Pastor. That's the beginning and the end of it: their Pastor's understanding of Faith, the Bible and Conscience. What will have to happen is a new fuller and deeper understanding of what it means to be in communion with the Pope. From Mark Chapter 10 "Therefore what God has joined together,no human being must separate." In the house the disciples again questioned Jesus about this. He said to them,"Whoever divorces his wife and marries another commits adultery against her; and if she divorces her husband and marries another, she commits adultery." It's pretty clear. Think about it. To confess to divorce and to marrying another is to confess adultery. To confess this sin while intending to violate the covenant of the (original) marriage again cannot constitute a valid confession. One cannot receive the blessed sacrament while in a state of serious sin. Are we headed for a Church that promotes heresy... but only where it won't face too much resistance? If so, Christ's Church will lose what's left of its credibility and legitimacy. Where has respect for collegiality gone? Is this not a time to listen to, along with the laity, the synod fathers, or do we choose to listen only to those who already agree with us? Pope Francis is a breeze from heaven. He is the preacher for the preachers. He is the preacher for the laity. We all are Church. We are family. And a listening family is the measure of a sound corner-stone, without it the Church will spiral into suicide. Pope Francis is awakening our conscious to the Holy Spirit. He is Faith in action. I'm privileged to have witnessed it albeit from afar. God Bless all synod attendees. Pax. Please explain how "a listening family is the measure of a sound corner-stone" and how would "the Church spiral into suicide"? I would have thought Faith, or the belief in God, might be a corner-stone. For from that stems Charity, which is the love of God, but "a listening family"? A sound cornerstone Ears to hear. Not everyone has been gifted with 'faith'. Many of the saints struggled with faith, for example, St. Augustine. Our contemporary, St. Mother Teresa of Calcutta found the going tough. I find faith a struggle at times just as I'm certain that you do. That's where 'ears to hear' come in..that is, a listening family..a listening family meaning being attentive to God and neighbour...this makes for a sound cornerstone. I don't know where you live but in my country approx. 80-90% of Catholics have walked out the door and it's the same predicament in Europe.....this is a Church suicide in slow motion...Why has this happened? So just getting back to my little blurb on the importance of listening: To Listen..is scriptural. The prophets listened. "Speak, Lord, your servant is listening” (1 Samuel 3:9). And, 1 Kings 19 describes how God made his presence known to Elijah at Mount Horeb, in “a still small voice.” If we don't listen we can't be effective in our communication. But our ability to listen well can be distracted by the White-noise of a busy world. We are only human and can easily switch off from that ,'still, small voice'. Christ listened. The saints listened....the desert fathers and mothers listened and St. Benedict taught us to listen with the 'ears of the heart' he was instrumental in saving our Church from suicide (lot of bad history back then) Holy Spirit is not measurable nor fixed. 'Truth' is infinite...it needs to be discerned and listening is the teacher. The synod is a great example of it's members not listening...how many times has the Pope said that Church doctrine won't be changed....how many homilies during the course of the synod have been pertinent to some of the synod member's paranoiac elements. “My thoughts are not your thoughts, neither are your ways my ways, says the Lord, For as the heavens are higher than the earth, so are my ways higher than your ways and my thoughts than your thoughts” (Isaiah 55:10-11) Let's say for example, that you are in line waiting to receive the Eucharist and your mind in a flash becomes distracted when you see a person inappropriately dressed or whatever else that creates in your mind an inappropriate thought...and Christ teachers us along these lines, 'angry words and or hateful thoughts' against another are on a par with murder..i.e. the commandment of thou shalt not kill..... How can any Catholic/Christian say, "I love God, but I do not love my neighbor.” 1 John 4:20, says that you are a liar if you say you love God and you don’t love your neighbour. How can you love God whom you do not see, if you do not love your neighbor who you see, who you touch, and, who you live with? So, where is the sense in banning people from receiving the Eucharist and the sacrament of Reconciliation....it's outrageously pharisaical. The only consolation is knowing that God is the final judge of each and everyone. Peace to you. 1. Let us take the confession issue again. If a divorcee has remarried, that divorcee is in the state of mortal sin. This is no judgement on my part or your part. This is a reality that the soul must face. "...he that shall marry her that is put away, committeth adultery." (Matt. 5:32) If the sinner remains in this state, he remains in the state of adultery willfully. How can he be sorry for his sin of adultery? And if he lacks true contrition and a firm purpose of amendment, how can he be forgiven? The priest must know this in the confessional, for he may ask the person if he has taken away or separated himself from this adultery. If the soul says no, the priest is bound by the sacrament and by charity and justice to God and to the soul and to his office to hold back absolution. You quote Christ's response to Peter on how often a man ought to forgive his brother. However, this quote means that a man must forgive those who offend, who persecute, who cause harm, but this forgiveness does not remit the act from the actor. The offender must still confess his sin, otherwise the sin is still on the soul. Remember St. Paul says, "I mourn many of them that sinned before, and have not done penance for the uncleanness, and fornication, and lasciviousness, that they have committed." (2Cor 12:21) And what is St. Paul's cause to mourn if the sins have been forgiven? But that they might be forgiven, but not remitted, and so the soul is still weak and not striving towards perfection. Again, Christ makes it clear that sinners will be damned for their sins. Speaking His betrayer, Christ says, "it were better for him, if that man had not been born." If Judas were sought forgiveness and was forgiven--but he despaired--why need Christ, who desires eternal life for all men, to say that it were better had Judas never lived? He also speaks of the man without the wedding garment being bound and cast into the darkness "where there shall be weeping and gnashing of teeth." We need to remember God's mercy and His justice. Now the story of the prostitute is there to establish God's mercy. But as I said before Christ commands her, "Go and now sin no more." 2. How does a person know that another is in sin? If the sin is private, he does not know. But the sinner is required to know himself and thereby recuse himself from communion if he knows that he is in the state of mortal sin. For a public sinner, such as those who openly support abortion, euthanasia; those who spread heresy, etc; the priest can know by the public nature of the sin and the lack of penance, as a public sin would demand, in justice, mercy, and charity, a public act of penance or a public retraction. 3. Let me take up this topic of "judging." Have you ever punished anyone, a son or a daughter? Have you ever reprimanded anyone? Have you not judged? It was you that actually said, speaking about the banning of people from receiving the Eucharist, "It's outrageously pharisaical." That is a judgement. But we must make a distinction between what is meant by "judge" in Scripture, for there are two senses. The first is condemnation, which is to be understood as sending a person to hell, as announcing that a man is damned. This is the judgement Christ refers to when He says, "Judge not lest ye be judge" for He follows it with "Condemn not, and you shall not be condemned." (Luke 6:37) In the story of the prostitute, Christ alludes to this same type of judgement. "Has no man condemned thee?...Neither will I condemn thee. Go, and now sin no more." For Christ there is only one significant condemnation, and that it to be condemned to Hell. As He says, "Be not afraid of them who kill the body...But I will show you whom you shall fear: fear ye him, who after he hath killed, hath the power to cast into hell." (Luke 12: 4-5). Even St. Paul, speaking of judgement as condemnation, says, "neither do I judge my own self. For I am not conscious to myself of any thing, yet am I not hereby justified; but he that judgeth me, is the Lord." (1Cor 4:3-4) And yet, all men are called to judge--that is, to gauge and to discern. For Christ Himself tells His apostles, "Beware of false prophets who come to you in the clothing of sheep, but inwardly they are ravening wolves. By their fruits you shall know them." (Matt 7: 15-14). How can man discern a false prophet if he does not make some judgement? How can man determine the nature of the fruit if he does not judge? And again Christ says, "Judge not according to the appearance, but judge just judgement." (John 7: 24). Here Christ actually commands not mere judging, but just judging. And so, it is not wrong to judge an action or determine a mortal sin. Nor is it wrong for one in authority to determine the virtue or the vice of those relying on him for guidance. The judgement that we are forbidden is condemnation. That is, declaring that the person is damned. This is duty of God, and no man. 4. And finally, I do remember the prodigal son. But I also remember that the prodigal son rejected his prodigal nature, abandoned his sin, sought to do and did penance by feeding swine (and would have done more), and begged forgiveness. The beauty of the story is not merely in the father forgiving, but also in the son begging forgiveness. Why St. Matthew chooses a Greek word that can mean "sexual immorality" or also "adultery" as many Biblical scholars contend, instead of "moicheia," I do not know. Regardless, both speak to marital infidelity and to immorality. Nevertheless, in answer to the first part, I simply say that the Council of Trent made it very clear that a "re-married" divorcee does, in fact, commit adultery. In such a case, the Church has declared infallibly on the subject. It would be good to go back and revisit the words of the popes through the ages on this matter, most specifically Pius XII's Casti Connubi. You will find the popes are of one mind in this matter--divorce is opposed to the nature of marriage and even to the natural institution as ordained by God. Pius XII even lists divorce, along with adultery, as some of the "basest vices." It is clear in the long tradition of the Church that, while at times separation through divorce may be necessary, neither divorcees--the innocent or the guilty party--may contract a second matrimony, for divorce does not sever the marriage bond. And so, we must not confuse an annulment with divorce. For a divorce, the marriage was and still is very real. "What God has joined, let no man put assunder." An annulment, on the contrary, is a declaration that the marriage never was due to some circumstance or fact that made the marriage "nul" as in non-existent. And the criteria for an actual annulment is determined quite simply but not haphazardly by nature and by Canon Law. It is not determined by feeling or by fancy. Nor do even serious post-ceremony problems create grounds for an annulment. There must be some matter before the marriage that gives grounds for the actual marriage to have never taken place, even though the couple may have gone through the motions of the marriage. In part 2, I will try to answer each individually. 1. It is not a matter of the annulment process, but it is a question of divorce. There is, as I said above, a great and grave distinction and difference between the two. One says there has never been nor is a marriage; the other requires, for grave reason, the husband and the wife, still married, to be separated for the safety of one or the other. 2. I am not sure what you mean by "didn't Christ sort that out when he descended into hell." St. Paul is calling the sinners to penance long after Christ has descended into hell, and ascended into heaven. Christ and the Church has always taught that it is not enough to confess the sin but also to do penance for it. 3. Again, I am confused. For it is Christ quoting Scripture, quoting, as it were, Himself, the author of Scripture, but He is still clearly saying that it were better that Judas "were never born." Christ, knowing what Judas will do and not do, knows where Judas is going. This is not some institutionalization of the damnation of a very real man. The model Judas gives us is not so much a model against greed, but the model of a man, especially a man close to Christ, who has rejected the grace of God and, as it seems from the words of Christ, loses his soul for eternity. 4. I agree, "go and sin no more" is meant for all men--this applies to the child stealing a cookie from the cookie jar and to the divorcee claiming to be married again. But at that moment, it was directed to her as she was one Christ was speaking to at that moment. 5. It is not merely an observation, for you are making a statement determining the morality of a certain act. It is a judgement, and it is nothing to be afraid of. In fact, Christ demands such things: "By their fruits you shall know them." (That is a judgment as well.) Again, we must distinguish between the two types of judgment: to judge as to observe and determine the good or the evil, or the apparent good or the apparent evil (which is what you do when you say, "It's outrageously pharisaical") or to judge as to condemn to hell (which is what one ought not to do when he says, "Because you have refused these people communion, you are damned.") 6. While remembering the prodigal son, remember that God is both all-just and all-merciful. Remember the man who does not wear his wedding garment. Remember as well the foolish virgins--a sad, sad parable--where the Lord says, "I know you not." Also, remember the unprofitable servant who lost his talent and was cast out where "there shall be weeping and gnashing of teeth." If a soul does not return to Christ and die in the state of grace, He cannot save that soul. God requires every human to will and to live according to God's grace. God requires every man to love Him by his own free will and to prove his love. A person guilty of adultery has the power to live according to God's grace by seeking forgiveness for and abandoning that mortal sin. But it is impossible to be sorry for a sin, but determining at the same time to remain in the sin. Where is the contrition? There is none. And no purpose of amendment, no contrition, no true sorrow, no forgiveness. Why is that so difficult to understand? It is true that the person may not want to leave abandon the actions that make up the sin, but that is what needs to be done. It is a question of how much they love God? They must decide. "Either you are with me or against me," says Christ. "No man can serve two masters...you cannot serve God and mammon." Let me pose this question. Let us say your son steals money from your wallet. He comes to you and says he is sorry. You forgive him but you ask him to return the money stolen. He refuses to return the money, but rather tells you that he will steal more money in the future. And the next day, he steals again. He comes and says he's sorry again, but again at the same time tells you that he will continue to steal more money and not pay any of it back. How good is his sorrow for his theft? That is hardly the prodigal son who returns to his father and asks to be accepted as a servant. All sins are not equal. Just as virtues have degrees according to their various ends and effects, so also vices have degrees according to their various effects and how and whom they offend. I think your source in Mark 3:29 already makes that clear that there are degrees in sin. St. Thomas Aquinas actually takes up this question and reminds us of John 19:11 when Christ says to Pilate, "He that hath delivered me to thee, hath the greater sin." The question is not whether a man or a woman might divorce, but rather can he or she remarry after getting a divorce? The Church, being directed by Christ, by His own words, clearly says that it is adultery to remarry. It may sound hard and hurtful, but the reality must be understood that the marriage bond lasts until the death of one of the married couple. No divorce can sever that. "What God has joined, let no man put asunder." To not be able to remarry may be a cross, but it will be a lot more beneficial than entering into a state of mortal sin. And so, the cross must be accepted for the love of God. Remember, if God sent His only Son to die for our sins, we can at least offer both small and great inconveniences and crosses to Him. Some we can offer by choice; others we must offer by necessity. No remarriage after a divorce is a necessity since the necessity is set by nature and divine law. A person guilty of adultery has the power to live according to God's grace by seeking forgiveness for and abandoning that mortal sin. But it is impossible to be sorry for a sin, but determining at the same time to remain in the sin. Where is the contrition? There is none. And no purpose of amendment, no contrition, no true sorrow, no forgiveness. Why is that so difficult to understand? It is true that the person may not want to leave abandon the actions that make up the sin, but that is what needs to be done. It is a question of how much they love God? They must decide. "Either you are with me or against me," says Christ. "No man can serve two masters...you cannot serve God and mammon." 1. Okay. Let’s say that the person living in the ‘guilt’ of adultery seeks to be forgiven through the sacrament of reconciliation. How can they….. when they can’t even get a foot in the confessional? Sign says, ‘We the ecclesiastical members of the Church have washed our hands of all adulterers….Go away you’re doomed”. 2. Now, let’s say that the relationship between the man and the woman was an absolute disaster from the beginning. They divorced and remarried and produced eight healthy children each…two of the children want to enter religious life. Both families are liked by their community….now, may I ask how am I supposed to get my head around these divorcees walking out from their families….eight children each and two partners. The scenario that I’ve just illustrated may sound like a ‘Walt Disney thriller’ but believe me this is a totally feasible argument. I believe that it is sinful for the Church to expect this abandonment of family…and to equate this.... "No man can serve two masters...you cannot serve God and mammon" compared to a father’s or a mother’s love for their children is nonsense.....Christ is in you, me and all those attached to my scenario. Let me pose this question. Let us say your son steals money from your wallet. He comes to you and says he is sorry. You forgive him but you ask him to return the money stolen. He refuses to return the money, but rather tells you that he will steal more money in the future. And the next day, he steals again. He comes and says he's sorry again, but again at the same time tells you that he will continue to steal more money and not pay any of it back. How good is his sorrow for his theft? That is hardly the prodigal son who returns to his father and asks to be accepted as a servant. 3. I don’t wish to sound facetious but my father once said to me. “The tempter is worse than the thief.” 4. Catholics also do not believe in Sola Scriptura (only) due to the fact that there is no guide to decipher important theological issues without the Church. The Catholic Church collected and organized the Holy Scriptures via Tradition, and has the Papal Office guiding and helping decipher important scripture verses. (http://www.theopedia.com/sola-scriptura) 5. It is evident from the ‘Synod of the Family’ that …”What God has joined, let no man put asunder." will be seen in a different light….AND, imho this is ONE OF THE SIGNS of a ‘Listening Church’ well, at least on the hierarchal side. PAX. . I will simply respond to this, as it seems we are not going in circles. 1. To a truly Catholic mind, your scenario is ludicrous. But it must be understood that it is ludicrous only if the penitent is truly penitent and is committed to abandoning his sin and the state of life that leads to that sin. If he does not, as I said before and will say again, there is not true contrition. Ergo, no possibility of confession. 2. It does not matter if the marriage was "an absolute disaster from the beginning." The vows of marriage state "for better or for worse...until death do we part." These are not mere sounds, but words with meaning spoken before God and binding before God "until death" severs that bond. That is the reality. Regardless of whether or not a sinful union produces children who are good, the union itself is still sinful. And it once more proves that only God can truly bring good out of evil. Just as from the bertrayal of Judas, He words our redemption. 3. The father, in this case, is not tempting his son. He is not intentionally leaving money for his son to snitch. The case is simply the son steals from his father. And what is more, you fail to answer the question. 4. It is true that Catholicism teaches that there are two forms of revelation: Scripture and Sacred Tradition. The Catholic Church, however, cannot re-interpret Scripture to be what it wants to be but be understood universally as Christ wants it to be. The meaning does not change from age to age. You might want to read Pius XII's Divino Afflante Spiritu and Leo XIII's Providentissimus Deus. 5. The Synod is not guaranteed infallibility and therefore can err and will err if it brings an understanding that is contrary to infallible declarations and to the universal teaching of the Church, to that understanding that has been handed down from Christ through his apostles and clarified by the Apostolic Fathers and by the Sacred Councils, such as the Lateran Council, the Council of Trent, and First Vatican Council, and by the infallible decrees of the popes. (I cannot include the Second Vatican Council in this list because there was, to my knowledge, no infallible declaration as it were a pastoral council and not a doctrinal council.) Remember St. Paul: "But though we, or an angel from heaven, preach a gospel to you besides that which we have preached to you, let him be anathema. As we said before, so now I say again: If any one preach to you a gospel, besides that which you have received, let him be anathema." (Gal. 1: 8-9) It is a shame that Catholics play haphazardly with very serious and soul-saving doctrine, which informs the action, which provides the principles by which we know and love God and, through God, our neighbor. That "breeze" is more like the smoke of Satan that Paul VI warned us about. Why do so many bishops appear to fear Pope Francis?